In this video, Swami Satyananda Saraswati discusses why and how we worship on Shivaratri. He answers questions about the holy day’s pujas, the symbolism of Shiva’s madness following the death of Sati, and tells one of the many stories regarding the origin of Shivaratri. Swamiji explains that after Sati left her body, a naked and crazy Shiva wandered from place to place, until one day he reached a village of brahmins. Upon asking the brahmin village girls at the well for some water, the naked Shiva got himself into trouble with the girls’ fathers, who cursed Shiva that his lingam would fall off. Lord Shiva is one of the trinity of all existence – Brahma, Vishnu, and Shiva – and Shiva’s lost lingam presented a great problem to creation: all procreation stopped. 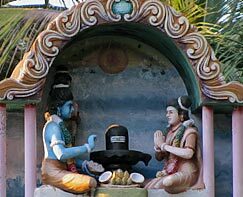 When the Gods requested that Shiva put his lingam back on, Shiva said that he would indeed replace his lingam… if all the gods and the brahmins stayed up all night worshiping his lingam with milk, yogurt, honey, sugar, ghee, songs, chants, and the usual offerings of puja. The Shiva lingam is one of the greatest symbols of Lord Shiva, the eternal Consciousness of Infinite Goodness, and it is traditionally placed upon a yoni, which symbolizes Shakti, the Divine Mother. When we offer puja to a Shiva lingam, we offer our highest respect to Pure Consciousness. We fill our minds with Divine Consciousness, and in doing so, experience the blissful union of Consciousness and Energy: Shiva becomes one with the Divine Mother, Energy, in both her manifest and unmanifest forms. At the Devi Mandir, Shiva Puja is performed every day. Shree Maa worships at Satyeshwar (her Shiva lingam in the Temple), a Devi Mandir pujari performs Shiva Puja at Napeshwar (the giant Shiva lingam in the forest), and Shiva Puja is performed at the Cosmic Altar as part of the Cosmic Puja. Shree Maa loves Lord Shiva, and Shiva’s bija mantra, “Om Namah Shivaya,” is one of her favorite mantras. Swamiji loves Lord Shiva too, and anyone who spends time near Swamiji can’t help but see Shiva’s divine qualities of renunciation, will power, and Infinite Goodness reflected in his way of being. Shiva is, after all, the Guru of the Gurus. On Shivaratri, we dance the dance of the Guru of all Gurus. It’s a night dedicated completely to the worship of Pure Consciousness, and it’s a very special occasion at the Devi Mandir. We hope that this video inspires you to join us in celebration on Lord Shiva’s night, in whatever way you can, so that we can place our attention on the Highest Goodness, purify our consciousness, and begin to experience the eternal presence of Lord Shiva together. Om Namah Shivaya! Hara Hara Hara Mahadeva!